While the ultimate result wasn’t gained, both driver James Moffat and team owner Garry Rogers have been pleased by the improved performance shown by the #34 Wilson Security Racing GRM Volvo S60 last Sunday in Sydney. Moffat qualified the car sixth, one place behind Scott McLaughlin, and then out-raced his highly credentialed team-mate in the #33 Volvo to be lying fifth late in the race and headed for his best finish of the season. But a lunge at Shane van Gisbergen for fourth ended in a spin for the Red Bull Holden Commodore VF and a drive-through penalty for Moffat that dumped him to 18th at race’s end. While upset by the outcome post-race, Moffat was also conscious that the performance shown at the Red Rooster Sydney SuperSprint potentially boded well for the balance of what has been a difficult season. “We have had a pretty rough season and when you have a result there that is taken away from you then I am pretty disappointed for the guys,” said Moffat. “But there is no doubt the positive we can take away from the weekend is we definitely found something in the car on Sunday and we were able to qualify strong and race there. “Our race pace hasn’t been too bad over the last few events, we have just been starting too far back. Moffat has this week been confirmed as having GRM’s Dunlop development series star James ‘Bieber’ Golding as his partner for the three-round Pirtek Enduro Cup that starts with the September 16-18 Wilson Security Sandown 500. Meanwhile Rogers acknowledged the strength of character shown by the crew on #34. Most enduring among them are engineer Manuel Sanchez and number one mechanic Kieron Woodger who have worked on the car since 2013, while Golding was number three in those days. Jake Rayner, who was data engineer on #34 in 2013 still works for the team. Back in 2013 Alex Premat was driving for the team in its privateer Holden form. In its period as a factory Volvo squad Swede Robert Dahlgren and David Wall have driven the entry before Moffat joined in 2016. The #34 crew have not enjoyed the same success as the #33, but Rogers said they have stuck to their task through thick and thin. “Believe me those same guys were there when Premat was crashing them and Dahlgren wasn’t quick enough and when David (Wall) was in the car. He did a good job but was never going to win,” said Rogers. “It was just so exciting for me to see those guys get that moment of glory. To me it’s the people in the pits and the workshop who get more excited than the driver when it goes well. 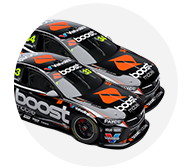 Rogers also declared the #34 a real shot at strong performances in Pirtek Enduro Cup, even though most focus will likely fall on the #33 as McLaughlin fights to stay in contention for a strong drivers’ championship result. “I believe that our recent speed illustrates that we are finding some very good form as we enter the endurance cup and I am confident that both of these line-ups have the potential to win,” Rogers said.